In the summer school holidays of 1993 I went to Spa with my father for the Belgian Grand Prix at the legendary Spa-Francorchamps circuit. It was the first time I had gone to a race with just him, and I was more excited than ever to spend the weekend at the track. It didn’t matter whether it was Formula One, a kart race, or Formula Renault, I’ve always loved the atmosphere of being at the track. The drive from Norfolk down to Stansted airport for our early flight was uneventful, but when we arrived, the airport had been evacuated due to a bomb scare. We were left standing outside in the cold for a time, but as it turned out it was just that, a scare. Before long we were on our way to Brussels. Having been delayed by the events at the airport, the morning Free Practice was already underway when we arrived at the circuit. As we drove down to the paddock, my father pointed up to the track where we could see bits of car debris, marshals and an ambulance and said, “looks like someone’s had a big off at Eau Rouge!”. I was at an age where the dangers of motorsport hadn’t really registered. I had no recollection of the tragic accidents of Gilles Villeneuve, Ricardo Paletti or Elio de Angelis, as I was too young to know. But this was to turn out to be a very different experience. Without giving it another thought we went through the motions of parking the car and making our way to the motorhome. I vividly remember walking into the awning (motorhomes back then were much more humble) and the big (box shaped) TV in the back was showing the breaking news of the first damning accusation against the ‘King of Pop’ Michael Jackson. Before we had taken two steps inside, someone came rushing towards my father and informed him; “Alex has had a big one.” I saw the realisation sink in on my father’s face, together with a high level of concern for Alex’s welfare. At the notoriously fast and challenging Eau Rouge corner Alex Zanardi had lost control of his Lotus 107B as he crested the hill, ramming the retaining barrier on the left side head-on, before spinning uncontrollably back across the track into the opposite barrier at the Raidillon corner. The initial impact was measured at 146.5 mph! All that remained of the Lotus was the monocoque and engine as one piece, which lay in the sand trap on the outside right of Raidillon (the exit of the Eau Rouge combination). As the McLaren of Ayrton Senna exited Eau Rouge, the Brazilian was forced to slow suddenly as his teammate Michael Andretti had virtually stopped on track when confronted with the debris from Alex’s car. The emergency stop caused Senna to spin towards Alex’s stranded Lotus, but fortunately the McLaren came to a stop just before the wrecked 107B. Alex briefly lost consciousness, but Professor Sid Watkins and the medical crew were quickly on the scene where Alex was now conscious. He was extracted from the car with a neck brace applied and then placed on a backboard. He was taken straight to the medical centre and after being kept under observation for a few hours, and with no injuries to speak of, he was allowed to leave and return to the team hotel. Later, Sid told my father, the only reason Alex survived the accident was because his head was tucked down in the cockpit following the first impact. He had been thrown so far forward that his head hit the steering wheel, and smashed it into the instrument panel/dash bulkhead. Sid’s explanation was that if his head hadn’t been angled forward at roughly ninety degrees to his torso; as the car pirouetted five times on its vertical axis; the extreme rotation would have snapped the brainstem. The force of impact and sudden deceleration had resulted in an extension of Alex’s torso; despite being tightly belted in to the car, he had stretched an inch in height, something Alex was pleased to tell everybody when he returned to racing. That evening, as my father and I left the track for the hotel, we saw fans collecting debris of Alex’s Lotus that remained at the side of the track. It seems funny, but at the time I couldn’t understand why anyone would want parts of a broken Formula One car, because for me Formula One was part of my everyday life and I didn’t understand the potential significance and value to the fans. When we got back to the hotel, we went to visit Alex in his room. He was sitting up in bed, the curtains were drawn with only dim lighting giving some illumination to the room as he was sensitive to light. When asked how he was feeling he quietly said in his lovely Italian accent, “I have a little bit of a headache” and then asked the typical racing driver question; “will the spare car be ready for tomorrow?” He looked like he had just come out of a boxing match, two black eyes, with dark bruising surrounding them, and even in that light we could see that the whites of his eyes were bright red from the burst capillaries. Of course there was categorically no way that he was going to be allowed to drive the next day! After Spa, Alex insisted he was fit to drive at the following race two weeks later at Monza. My father flat out refused. When he analysed the events that had lead up to the accident at Eau Rouge he came to the conclusion that Alex had had too many knocks on the head to be racing any time soon. Reviewing the events preceding Spa, it became clear to my father that there was a pattern to what had unfolded, and it probably all started at the 1993 British Grand Prix at Silverstone. Right at the very end of Saturday morning’s Free Practice there had been a brief rain shower at Copse corner, just before Alex turned into the corner. He lost control on the slippery surface and speared off the track into the barriers on the outside of the corner. When Alex got back to the garage, he said he was fine but the car was a “little damaged” and prepared for qualifying as normal . My father had not actually been to the garage since the crashed car had been returned, but when he came back for qualifying, he went to have a quick look at the damaged 107B. It didn’t look too bad, but what concerned my father was that the steering wheel had been badly bent and jammed solidly into the instrument panel (sounds familiar?). It seemed obvious that Alex, although not complaining, must have had quite a headache. As qualifying continued Alex’s times weren’t too bad, but in the final minutes Alex spun on the approach to Luffield corner. A little worrying! The German Grand Prix at Hockenheim followed two weeks later, but early on in that race week, Alex rang my father to say he had a broken foot! After a long story (Alex’s stories were never short!) about where and when, Alex explained that he had been in Bologna and had stepped out to cross a side street when a car came around the corner and ran over his foot. Determined as always, Alex was adamant that everything was fine and that he had been to see Doctor Costa (of motorcycling fame) who said it would be no problem for him to drive. Under no circumstances was he going to let anybody else drive ‘his’ car, and he duly arrived at Hockeheim with a big smile and a very oversized racing boot. He cleared this with the FIA and settled into his race weekend. Over the weekend there were a few spins but no damage. These spins were given reasonable leeway as the active suspension 107B was quite edgy on low downforce which meant the cars struggled for straight-line speed on Hockenheim’s long straights. Alex’s race finished in a sand trap, but giving him the benefit of the doubt, he could be forgiven a mistake when pushing on pretty hard with a difficult car. Next up came Hungaroring, where the cars again struggled. A pretty trouble free practice left hope for some result, as historically as long as you finished the race, there was a reasonable chance of being in the points. This was therefore my father’s message to Alex on the grid, “just stay out of trouble and finish”, which he acknowledged as understood. After only 14 laps Alex had spun, but had been off track before that, continuing until he was put out by gearbox trouble. Needless to say there was a rather tense meeting after the race about ignoring my fathers request to be conservative. Next time Alex stepped into the car was Friday morning in Spa where he was starting his second lap of the weekend, when the accident happened. My father has no doubt that Alex had suffered an ongoing effect from the accident at Silverstone and despite being passed fit to drive, he probably should have had a rest from the cockpit to give his brain time to recover from what was a pretty big impact. The subsequent escalation of mistakes can be traced back to a number of knocks on the head, which either affected balance or reflexes, but at the time teams were used to the drivers having offs and returning to drive again. Their own assessment of how well they were was readily accepted as long as they had been cleared by the FIA. The experience of the scenario above, the benefit of hindsight, and knowledge since acquired through my father’s close relationship with Professor Sid Watkins, means we take a far more critical review of our drivers’ fitness to race, following any impacts, or accidents. Sometimes it is better to miss a race or two and come back fitter and stronger, than rush back into the car and just keep making the same mistakes because you’re not at your optimum. Certainly the last person you can trust when enquiring about their health is the driver who had the impact, because all they can think about is getting back in the car, and if they’ve had a knock on the head, their judgement is very likely impaired. As a company, Allinsport aims to do everything in its power to arrange optimal equipment, environment and support for the driver to enable them to be the best they can be. With the inevitable human factor creeping in, we, as a family have lost too many friends to the dangers of motorsport, the last thing we would want is to put any of our drivers at risk, however much they may protest at the time! In making sure I had the details right about the accident I googled Alex’s 1993 accident and saw the footage for the first time. It was quite a shock to see how big the accident was and now that I think back to seeing him in the hotel it was amazing just how relatively unharmed he was. A testament to the safe construction of the Lotus chassis, not to mention a great deal of luck. Following his accident at Spa, Alex did not race again in the remaining races of the1993 season. 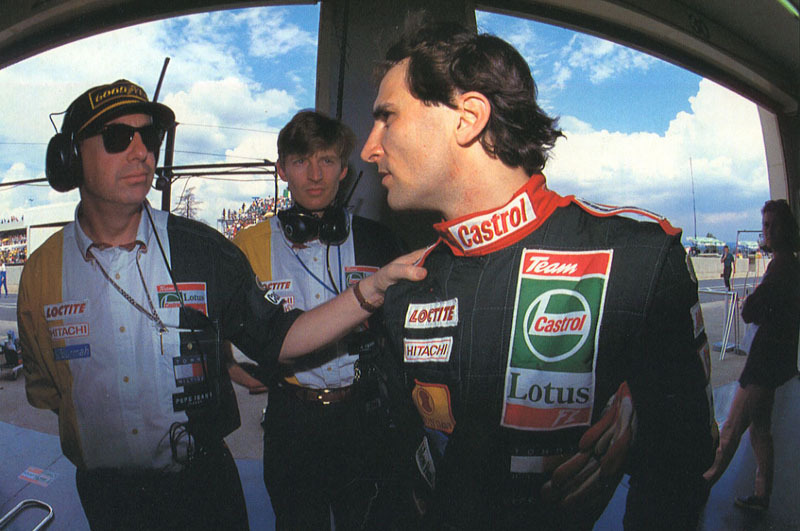 When he did get back in the car in testing in late November of that year, up until Monza 1994, he didn’t damage the car once. He was back to being the driver my father felt had so much potential. It turned out that Alex had had another “little” accident when he was in the Jordan at the Australian GP, before he joined Lotus and had received a pretty big knock to the head. Alex later joked with my father that perhaps the accident at Eau Rouge had knocked something good back in place. Certainly his subsequent dominance of Indycar and multiple Championships suggested that was quite possibly the case.